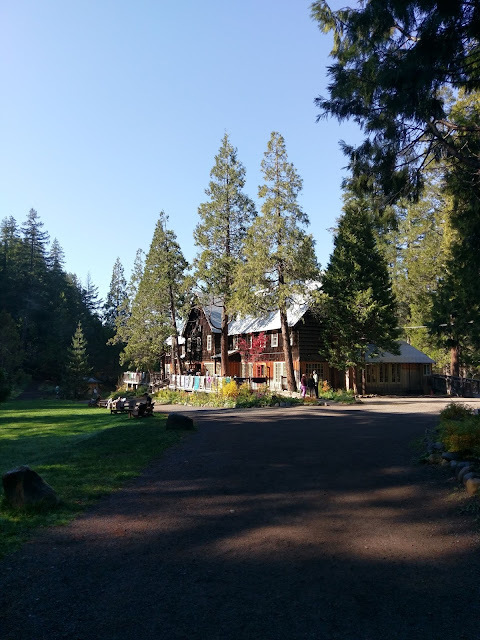 I am a little bit late in getting out last weeks post for our group, Sundays with Joy…better late than never is what I say. I actually debated about even posting at all because I was so late in the game. Then I thought to myself, I better write and let everyone know that the idea of making something so delicate and HUGE in the baking world was not as hard as I had expected it to be. 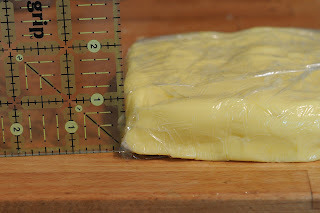 Oh it was scary at first because of the time necessary to make the pastry, the amount of butter that could potentially be wasted (butter can be expensive in some places) and then would it actually work. Will I make it again? Absolutely! It was easy. The time issues were irrelevant because I am already spending most of my day in the kitchen. I just used a timer and kept track of what I needed to do next. If this is your first time then do some homework first. Study, prepare and watch. I would never suggest that you take a test without studying first. This recipe is similar to taking a test. It's something that most "home" bakers would not attempt, we save these types of recipes for the professionals. Well you are in luck, because I happen to know a professional that has put together a fabulous video of how puff pastry is made. This is Jenny from Pastry Chef Online and she will show you step by step how to make your own puff pastry. I know of two ladies that used this video to make their own puff pastry with excellent results. I chose to try a different recipe because I had already found a recipe that I knew would work for me. I found some that wanted you to set aside 36 hours, um I don't think so….maybe next time. I chose to go with Emeril Lagasse's recipe. The recipe can be found here. I will tell you the recipe has been given a level rating of difficult. I think this is a time rating, not an ability rating. If you can use a rolling pin and keep track of a clock your good. I will show you below, step by step, just how easy this will be for you to make yourself. Be inspired to try something new every once in a while, you might just surprise yourself, I know I was and still am each and every time I venture into the unknown. 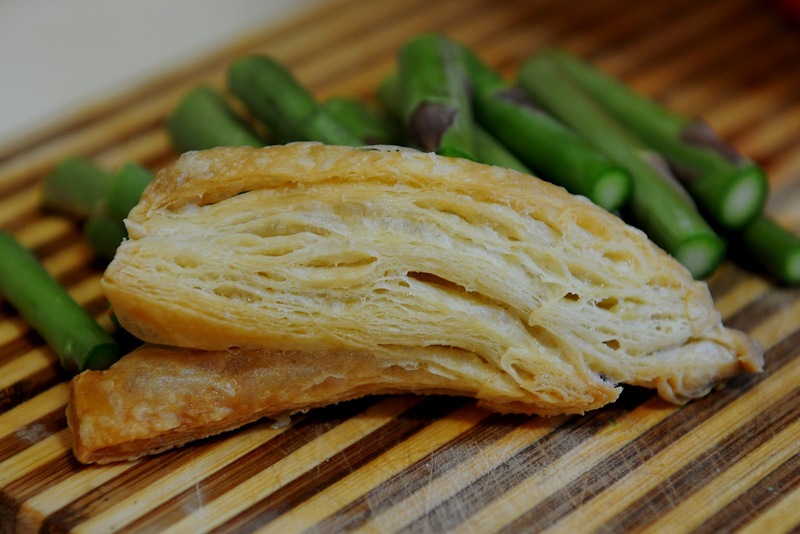 Puff Pastry can be used in a variety of ways. I used it for Joy the Baker's recipe, Leek and Asparagus Quiche that can be found in her new cookbook. 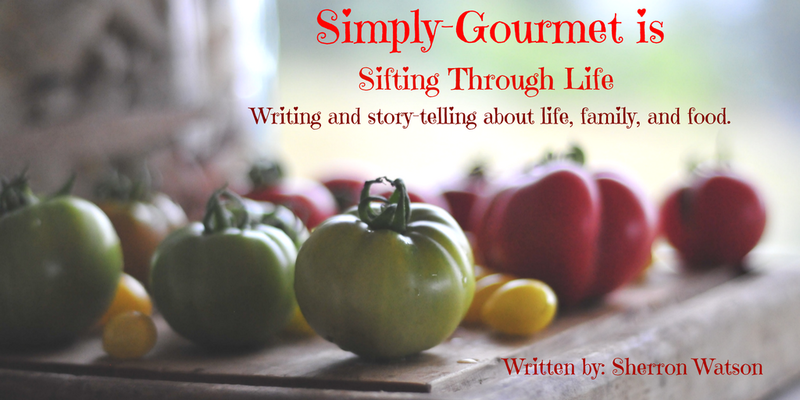 You can purchase the cookbook here if you have not already done so. NOTE: I used Kerrygold butter in this recipe. 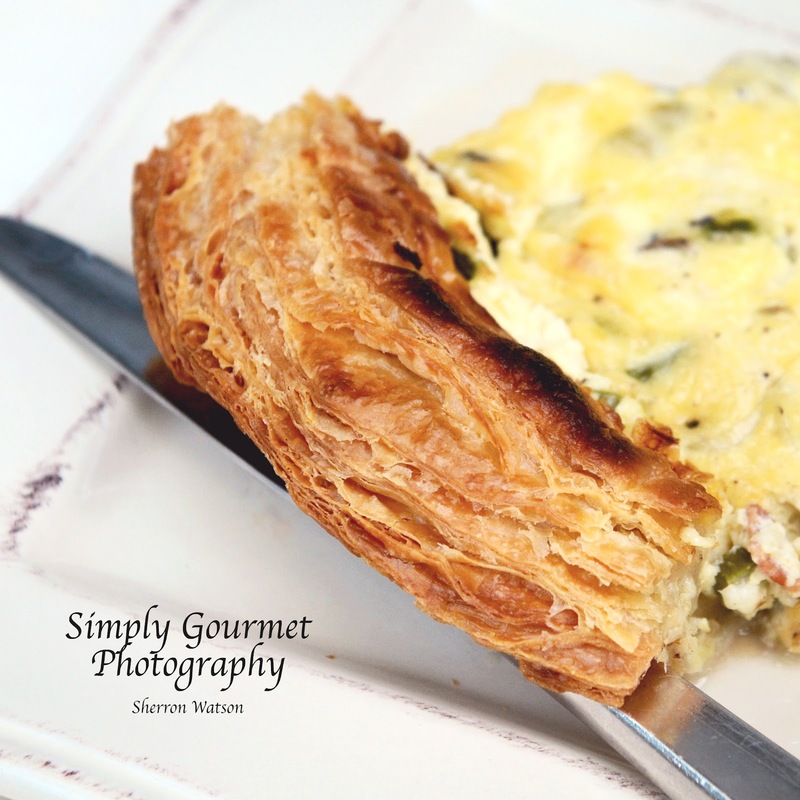 I was unable to find unsalted and so I used salted and the puff pastry turned out great. 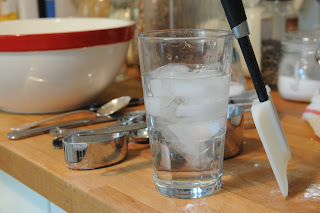 I reduced the salt amount from 1 1/2 teaspoons to 1/2 teaspoon. When not using the butter that is required in the recipe at the time, ALWAYS keep it chilled in the fridge. It needs to stay as cold as possible. Sift together the flour, cake flour, and salt into a large mixing bowl. Grate 6 tablespoons of the chilled butter and add it to the flour mixture. Using your fingers, mix and crumble the butter into the flour. Make a well in the center of the mixture and add the water. To make my water as cold as possible, I added ice to a glass and let it sit. When I needed it, I measured out the amount I needed. Use a rubber spatula to gradually blend the water with the flour mixture, mixing just until a rough, combined dough ball comes together. Turn out onto a piece of plastic wrap. 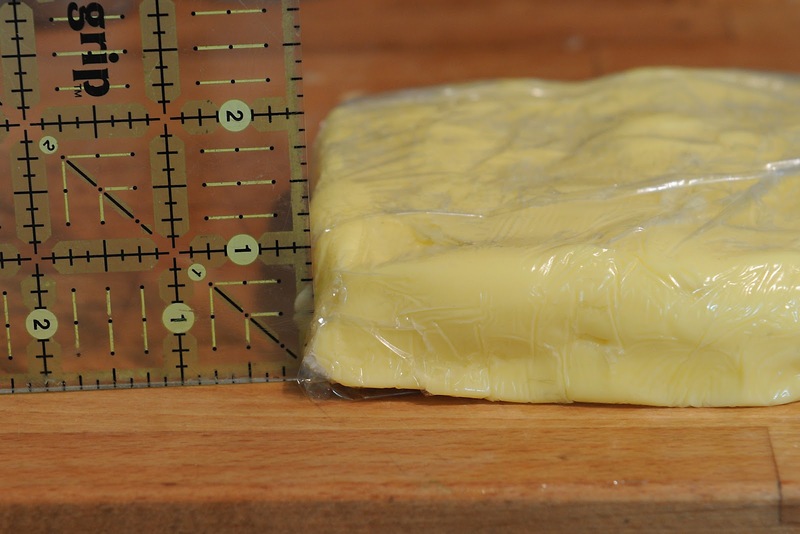 While the dough is resting in the refrigerator, create your butter brick. Using your palms and fist mold the brick into a 5X5 square. You can see below that my thickness was about an inch. Return this to the fridge, wrapped in saran wrap. COLD COLD COLD is how you want your butter to stay! 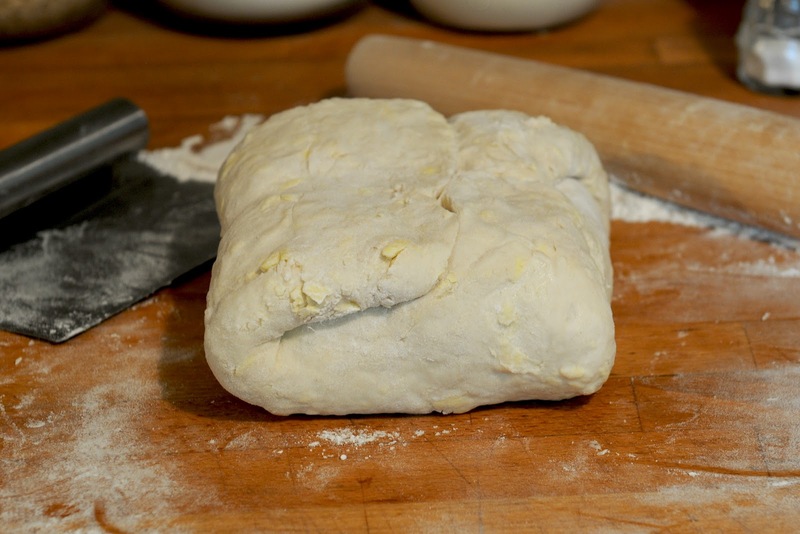 Remove the rested dough from the refrigerator and place on a lightly floured work surface. 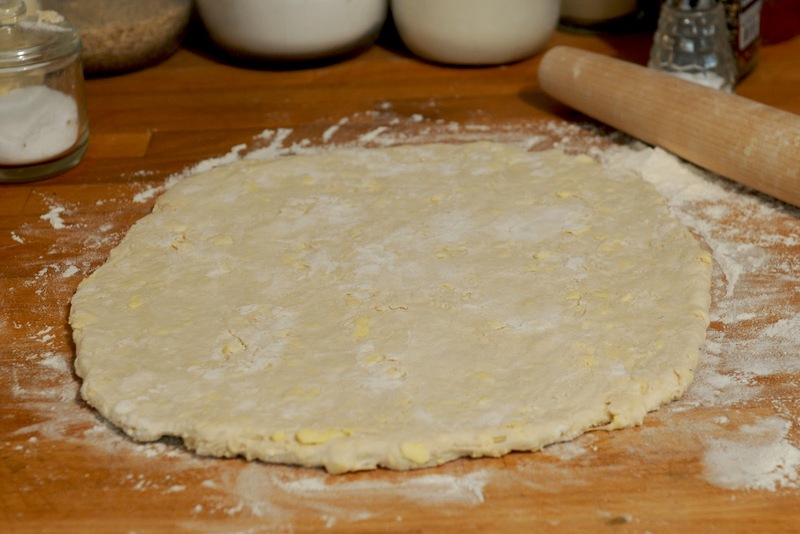 Roll out dough into a 12-inch circle, being careful not to pull or tear the dough. You will see chunks of butter in you dough, this is okay. 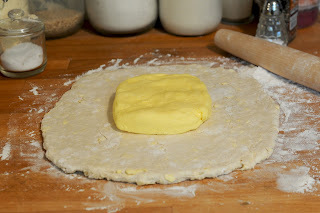 Remove your butter brick from the refrigerator and place in the center of you round dough. 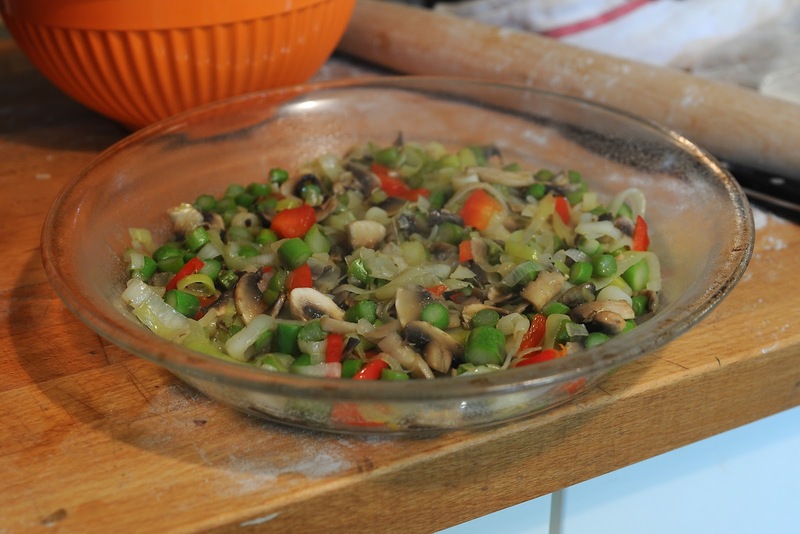 Wrap the dough and seal the edges by gently pinching. You should now have a square of butter wrapped in dough. Now you are ready to start the layering process of rolling, folding and turning. This process will be done 6 times over the course of the next 24 hours. The first 4 will take place in the first 2 hours, the dough will rest over night and then you will do the final 2 rolls, folds and turns. This is how you accomplish this. Using your rolling pin, roll out the dough package (butter inside). This may take some muscle because your butter is very cold. 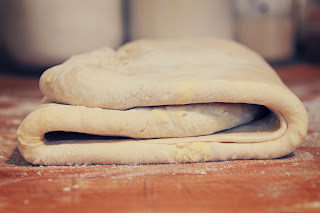 Using a bit of force roll your dough until it reaches 16X8. The 16 inches will be rolled away from you. The width is 8 inches. Take the side closest to you and fold in thirds to the middle, take the top portion and fold that into the other fold. Think in terms of folding a letter to put into an envelope. Turn the dough so that the folds are facing you. See picture below. This is the first turn, 5 more to go. Repeat the rolling, folding and turning. This is the second, 4 more to go. Wrap dough and return to refrigerator for one hour. Take dough out and repeat the rolling, folding and turning two more times. Two more turns to go. At this point you can return the dough to the refrigerator and let it sit overnight or up to 2 days before the final two turns. I chose to let it rest overnight and in the morning, I rolled, folded and turned my dough for the final two. Return to the fridge and let rest for 2 hours. Your dough is now ready to be used. 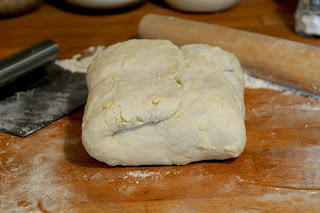 On a floured surface roll you dough out gently. You don't want to rip the layers. As I have already stated, I was using this dough for a quiche. 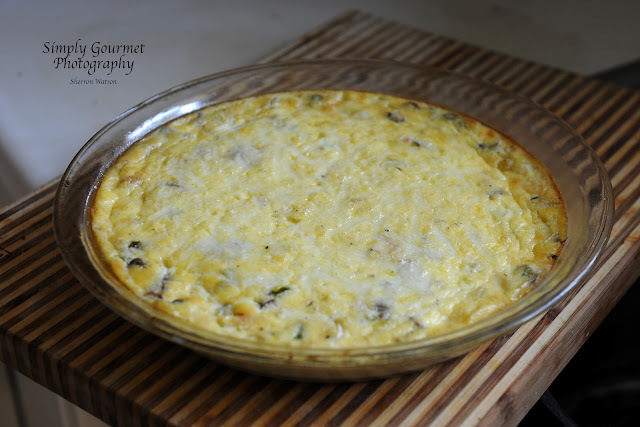 The pictures are below, showing the steps that I took to make the quiche. NOTES: I would like to say several things about rolling the dough and baking the dough in the quiche. I am making these notes because as a newbie to this puff pastry stuff, I had no idea of how thin or thick to roll the dough or cutting the edges. When you are rolling out your dough, try to go as thin as you can. 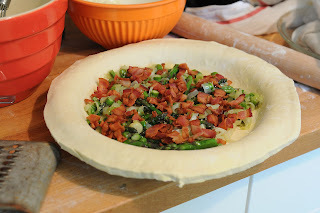 If you do not do this, then your dough may not cook up flaky, but more steamed like on the bottom of the quiche. 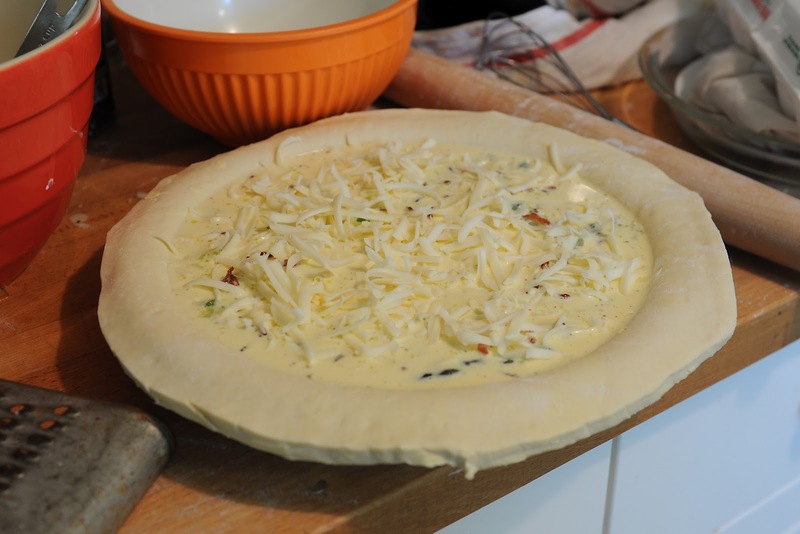 1/8 inch or a little more is ideal for the quiche only. 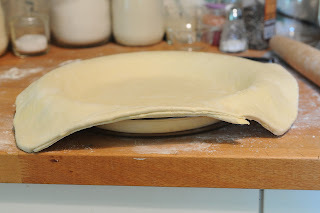 Hopefully if you use the pastry for other recipes they will instruct you on how thick to have your pastry for that specific recipe. Your knife should be sharp. You want to cut the extra dough, not push the knife through. By having a sharp cut you will allow the layers to puff up. If you push your knife through the dough, you may seal the layers. Roll our your dough and place in your desired dish. I used a 10inch pie plate. 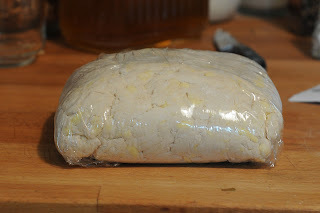 Trim off all the extra dough until about a quarter of an inch is hanging over. I chose to do a little bit more because we like the puff pastry. 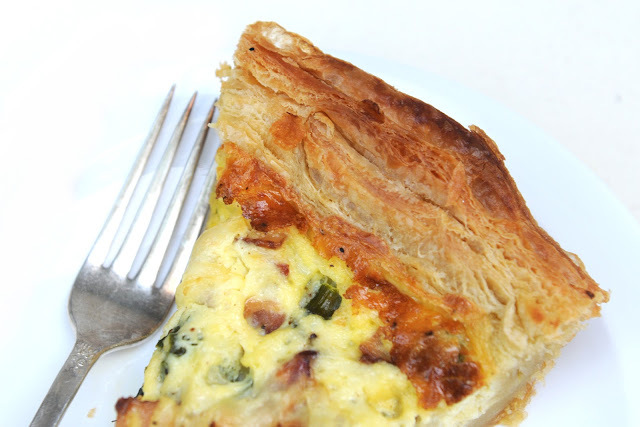 Return pie plate to refrigerator until you are ready to fill your quiche. 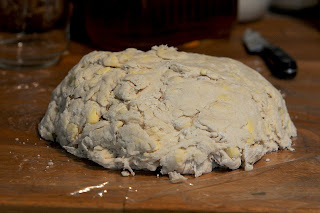 This picture is showing the dough before I trimmed off the excess. 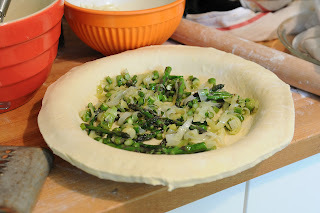 I sauteed the leeks and asparagus before adding them to the quiche. 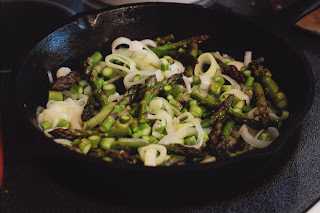 The leeks should be a bit transparent, similar to cooking onions. Fry up your bacon until crispy. 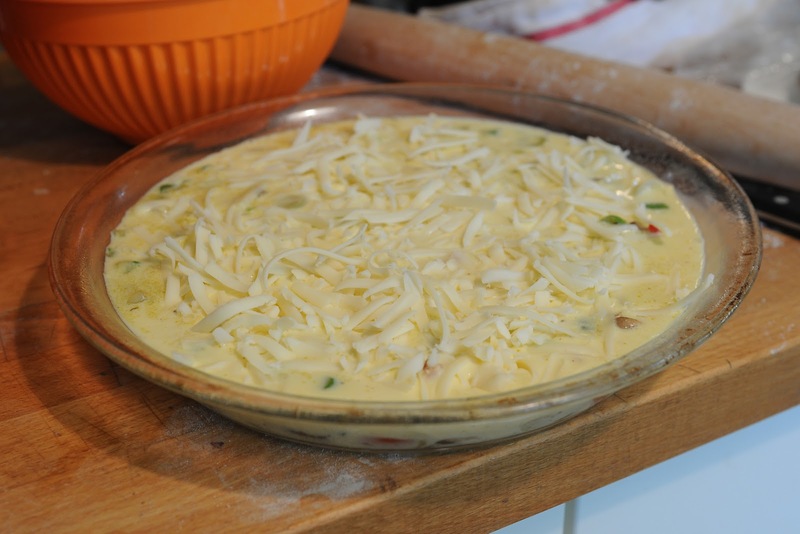 In a large bowl combine the cream, milk, eggs, 1/2 of the cheese and spices. Mix well and top your bacon, leek and asparagus filling. Add the final 12 cup of cheese to the top. Bake the quiche for 40 minutes. Make sure your quiche is not to close to the top of your oven. It may burn or get your puff pastry too dark. I like to place my oven rack towards the bottom. You want the crust to be a nice golden brown. I would recommend that you take all of the scraps and cook them on a cookie sheet. To make the crustless version. Use the ingredients above, minus the puff pastry. You also should check the quiche after 25 minutes. It does not need to cook the full 40 minutes. Sherron, you are amazing! I've made croissants before so I'm familiar with the basic technique here, now you've inspired me to give puff pastry a try. You notes are so helpful, thanks for sharing with the rest of us! Homemade puff pastry sheet and delicious looking quiche! So wish that I live nearby! ;-). 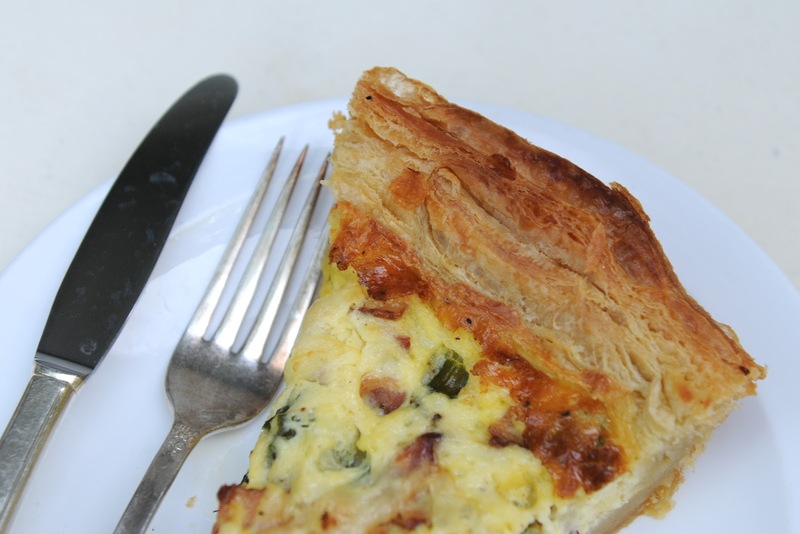 No, I didn't mean to get a piece of the quiche but to learn baking tougher with you! I need a great teacher to teach me baking... Ok ok I meant both! Nami, anytime you come this way we will bake together..LOL and we will eat to our hearts content!